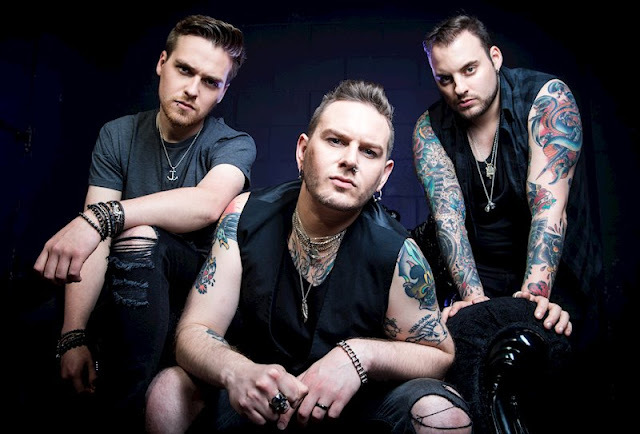 Brighton based heavy rock trio THE ROCKET DOLLS are ready to ignite with the news they'll release their full-length new studio album 'DeadHead' on Friday the 6th April and take it on the road for UK live dates. Featuring just the right amount of melody with straight up hook laden driven riffs combined with curveballs when you least expect them, 'DeadHead' is a must hear album for 2018. Recorded at London's award-winning British Grove Studios (David Gilmour, Razorlight, Mark Knopfler) 'DeadHead' was produced and mixed by Mark Roberts (Black Peaks, Rob Chapman, Toska, Dorje). Relentless in their approach, The Rocket Dolls have taken the rock mould, smashed it, and then meticulously pieced it back together again to deliver a fresh contemporary collection of music that combines the best bits of heavy rock, grunge, punk, and pop smart sensibilities. It's clear the band have spent time wisely crafting their second album, as it's a monster. The art work for 'DeadHead' was created by Sam Hayles at DOSEprod (Earthtone 9, Pitchshifter, Jayce Lewis) and serves as a poignant reminder to the meaning behind the forthcoming release. "Sam captured the essence of what our new album is about", explains Nikki Smash (lead vocals and guitarist). "It's a reflection on personal demons and modern day society; the split in the wolf (half animal / half machine) symbolises the transformation between good to bad and bad to good. It demonstrates not just the struggle of depression and anxiety that inflicts itself upon our society, but also the wolf in motion should be seen as a symbol of hope and the need to fight and overcome what's wrong in our world." “I wrote most of this record in a short space of time. It just started pouring out of me, the riffs, lyrics and melodies moulding the vibe of each song, and creating a monster of a dark, fighting, battle laden, anthemic rock album. It’s both a very personal album, but also a reflection on modern day society. We’re all incredibly proud of ‘DeadHead’, it’s our strongest collection of music to date and we can’t wait to share it with all our friends. 'None Of This Is Right is a summary of my whole situation at the time, recovering from being ill and being addicted to prescription pain killers and the confusion of knowing what is happening and fighting yourself to stop." The Rocket Dolls new album 'DeadHead' is out 6th April 2018.